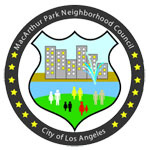 The MacArthur Park Neighborhood Council is an organization that was officially certified by the City of Los Angeles in June 2003 to increase our influence with City lawmakers and departments to improve our community. The Neighborhood Council came about as a result of Los Angeles City Charter Reform in 1999 to empower stakeholders in our community. The Board is elected by stakeholders and holds monthly meetings, usually on the first Wednesday of the month. The Board is comprised of volunteers. The Board is allocated a budget of $37,000 by the City from your tax dollars. The board consists of 17 board members. A meeting must have 9 members for a quorum to do business.